Thanks to everyone who came out to the presentation last night at the Centennial Theatre. We had a full house. We were delighted. It really means a lot to us. We really enjoyed ourselves and hope you all did too! In 1845 a lavishly equipped two-ship expedition led by Sir John Franklin sailed to the Canadian Arctic to chart the last unknown swaths of the Northwest Passage. Confidence was high, given there was less than 500 km (310 mi) of unexplored Arctic mainland coast by then. The expeditions by Franklin and McClure were in the tradition of British exploration: well-funded ship-borne expeditions using modern technology, and usually including British Naval personnel. By contrast, John Rae was an employee of the Hudson’s Bay Company, which was the major driving force behind exploration of the Canadian North. They adopted a pragmatic approach and tended to be land-based. While Franklin and McClure attempted to explore the passage by sea, Rae explored by land, using dog sleds and employing techniques he learned from the native Inuit. The Franklin and McClure expeditions each employed hundreds of personnel and multiple ships. John Rae’s expeditions included fewer than ten people and succeeded. Rae was also the explorer with the best safety record, having lost only one man in years of traversing Arctic lands. In 1854, Rae returned with information about the outcome of the ill-fated Franklin expedition. The first explorer to conquer the Northwest Passage was the Norwegian explorer Roald Amundsen. In a three-year journey between 1903 and 1906, Amundsen explored the passage with a crew of no more than six. Amundsen, who had sailed just in time to escape creditors seeking to stop the expedition, completed the voyage in the converted 47-ton herring boat Gjøa. 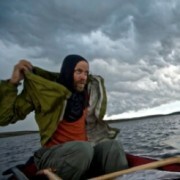 In 2003 Kevin Vallely was named one of Canada’s leading adventurers by the Globe and Mail. His adventuring resume is stacked with compelling expeditions to all parts of the world including skiing Alaska’s 1,860 km Iditarod Trail; scampering over Vancouver Island’s West Coast Trail in record time, attempting to bike and climb the island of Java’s 13 -10,000-foot volcanoes (a trip cut short when post-9/11 Indonesia became too dangerous); competing on the only Canadian team to finish the last and most difficult Eco-Challenge adventure race held in Fiji in 2002; retracing a 2,000 km Klondike-era ice-bike route through the dead of an Alaskan winter, and most recently, with teammates Ray Zahab and Richard Weber, breaking the world record for the fastest unsupported trek from Hercules Inlet to the geographic South Pole. Paul comes from Limerick in Ireland and has lived in Vancouver since 2008. Growing up, sport was always a huge part of his life with rugby being his main passion for many years. In 2003 Paul cycled across Australia from Perth to Sydney. This 5,000km cycle which took 60 days to complete, might have been a bit quicker if it wasn’t for getting knocked down not once but twice by cars – luck of the Irish, don’t think so! Paul’s next expedition took him from land to ocean. On November 30, 2005 Paul rowed out of a small marina in the Canary Islands and after enduring the tail end of a hurricane and 2 tropical storms that dished up some of the worst weather ever recorded for that time of year, Paul arrived into the Caribbean Island of Antigua to complete an 85 day rowing voyage. Paul and his rowing partner Tori wrote a book about their Atlantic exploits which was published in Ireland in November 2006 and in Canada in 2009 – the book is entitled “Crossing the Swell”. 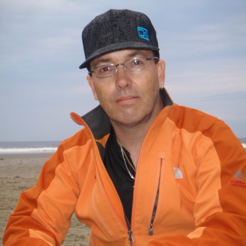 Frank is an award-winning Canadian filmmaker and writer specializing in adventure and environmental documentary film. As director and host he has covered stories from around the globe using a unique shooting style and humorous approach in order to make the often esoteric outdoor world appeal to a broad audience. Denis also comes from Ireland, Dublin to be exact and was born to Frank and Valerie Barnett in late August 1980. His early years were spent playing Rugby and Sailing before his hunger for a little more excitement took hold. Rally driving was first up, followed by water skiing and sky diving and when time allowed a career in Financial Services. 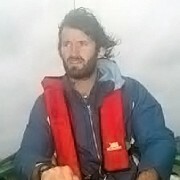 When considering rowing the Atlantic Ocean in 2006 Denis made enquiries with some Irish people who had completed the row. A move to Canada soon followed and the idea was put on “ice”. Ocean rowing boats are specifically designed to deal with the harsh conditions that an unpredictable ocean swell can dish up. They need to be tough, fully self contained with the ability to self right in the event of a capsize. However our boat needs to be designed with slightly different considerations in mind. Ultimately we are not rowing an ocean but rather rowing through the very challenging North West Passage where stiff winds, choppy swell and obstructive ice conditions will play a huge part in our progress through the passage. Accordingly, our boat needs to be designed with these considerations in mind. Therefore our hull shape will differ from many traditional ocean rowing boats and the boat will need to be reinforced with Kevlar to potentially withstand encounters with ice. Our boat (which will be 25ft in length) is complete. We were very fortunate to have Robin Thacker on board as our chief boat designer and builder. Robin brings not only a wealth of experience to our team but also an infectious passion that is going to result in a truly one of a kind boat which we know will be more than capable of withstanding the harsh elements of the Canadian Arctic. 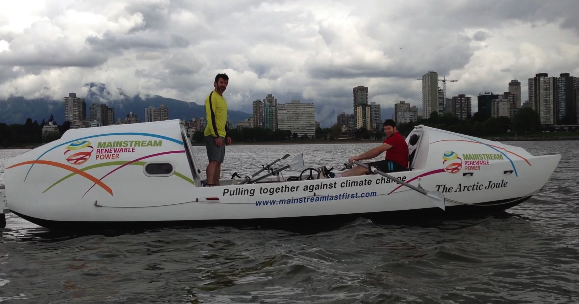 Capsize testing of the boat will take place in Nanaimo, BC during the second week of May, 2013. Robin ThackerRobin’s adventure started when he was 4 years old and he decided to jump off the 2nd floor balcony with an umbrella as a parachute. It almost all ended when he spent 4 minutes in an underwater hydraulic after going over a waterfall on a canoe trip down Riviere Ouareau. He could have used the umbrella. Since then, he has always had a need for adventure. So, he got married and now has three wonderful daughters. He wrote the software that the Canadian Civil Air Search and Rescue Association uses in searching for missing persons. He holds multi-national patents on guitar bodies and fibre reinforced ceramics. He has countless copyrights on things from snowboard chord calculation software to 1/16th scale flight simulator models. Currently, he designs the world’s finest kayaks for Atlantis Kayaks on Vancouver Island. When he’s not doing that, you will find him with his wife Karen filming and traveling this wonderful world of ours. Without the help of our sponsors and team this journey would be impossible. Mainstream Renewable Power is a company driven by a unique mission to lead the transition to a world where electricity is made from renewable sources. The world is undergoing a once-off transition to sustainability. Wind and solar will overtake coal, oil and other fossils as the world’s primary fuels for electricity generation. Mainstream was set up to lead and accelerate this transition. We inspire and enable everyone to lead active outdoor lifestyles. We do that by selling outdoor gear, clothing, and services. We match our members with gear that suits their needs. But we offer more than products. We offer passion. We love to share our expertise, experience, and enthusiasm. Our home, located on Vancouver Island, Canada, is NOT a tropical paradise. During winter, our rocky log strewn beaches are smashed by intense North Pacific storms.The water is cold. Very cold. The ocean conditions are not always ideal, however this is our home and playground... the testing grounds for OCEAN RODEO. With our rugged conditions, quality and innovation is a necessity, not an option.Our first product was the PYRO drysuit, designed in 1999 to allow us more R&D time during the cold winter months. Our kites followed a similar path, developed to withstand a beating; we incorporated the toughest materials and construction techniques imaginable, while delivering the power and performance to exceed our expectations.We design, build, test, redesign, re-test, re-think every product we offer to ensure you the safest, most performance oriented wind and water experience. At Restore Physiotherapy you will get the undivided attention of your physiotherapist for the entire duration of your treatment session. You can choose to book either a 30 or 60- minute appointment. This focused, one-to-one approach facilitates the development of a more comprehensive treatment plan and allows for more productive treatment sessions with more time for patient education, manual techniques, and supervised exercise.Our aim is to identify and correct the dysfunctional movement patterns that are often at the root of pain and injury. This facilitates a more complete rehab process, and empowers the patient with the knowledge of what to do to prevent, minimize, or self-manage reoccurrences.We offer intervention across the spectrum of wellness and function -- from preventative screenings to injury rehabilitation, to peak sports performance -- and will create an individualized plan to help you reach your goals. At Synergy Physio we’re committed to helping you move better, feel better and be better. By combining current research with clinical expertise, LJ Lee and her team will help you find ways to change movement patterns that are causing you pain and help you get back to doing the things you love.Whenever you see a Synergy Physiotherapist, you will be assessed and treated as a WHOLE person, rather than as a particular body part. The Thoracic Ring Approach (LJ Lee) and the Integrated Systems Model (LJ Lee, Diane Lee) provide common frameworks that are used by the entire Synergy Team. The Vancouver Aquarium supports the Mainstream Last First expedition's mission to bring greater awareness to the general public about the Arctic and the changes it is experiencing. Used by high performance athletes including runners, triathletes and cyclists, 7SYSTEMS endurance sport supplement helps them recover from the demands of training while boosting resistance to the infections that international travel and competitions expose their bodies to. That’s because their bodies get the nutrients they need for Basic Body Health and Critical System Support, including ingredients like Ginseng and a powerful anti-oxidant blend to help strengthen the Immune System. Pacific BioEnergy is a private company established in 1994 with corporate offices located in Vancouver, BC and operations in the heart of British Columbia’s forest region. We are a leader in wood pellet fuel in North America and are committed to meeting growing worldwide demand for this clean energy source. Tidal Transport & Trading is a diversified Marine Services Company based in Port Moody, Vancouver, British Columbia. In order to provide enhanced service to our principals, Tidal Transport & Trading USA Ltd, based in Long Beach, California was established in 2005.Through the combined experience of company personnel having detailed knowledge of port logistics and regulatory requirements in British Columbia and the United States West Coast, Tidal companies are positioned to provide a unique level of personal service to the international and coastal marine transportation industry. Imtech Marine is a leading company in the global marine market, operating as a full-service provider and system integrator of tailor-made, innovative and sustainable technology solutions covering the whole ship. ISL Customs Brokers, a division of Island Shipping, continues to be the innovative leader in providing customs brokerage and international trade solutions to business. To excel in your sport or fitness endeavour, you have to set goals and be driven. You push hard. You strengthen your commitment.We play by the same rules. Commitment. Passion. And the push to help you succeed.We’re passionate about sports and fitness, health and wellness. That’s why we started POWERBAR — to help athletes like you reach your goals by providing convenient nutritional products. All of our products are backed by decades of sports nutrition science and must live up to our high standards to meet the nutrition and energy needs of all athletes — from world-class champions and dedicated amateurs to beginners. DBC Marine Safety Systems Ltd., a division of "Survitec SOLAS Liferaft Business", is now owned by the Survitec Group. The company will continue to manufacture highly engineered and quality marine Lifesaving equipment, Survival Clothes and equipment, and Fire Safety Systems for both Marine and Commercial applicationsDBC was incorporated in 1977 and is one of the largest and most experienced marine lifesaving equipment manufacturers. Since its inception, DBC has developed and continues to manufacture a comprehensive range of yachting and commercially approved liferafts, platforms and passenger evacuation systems. London Drugs supports the Mainstream Last First Expedition’s mission to bring greater awareness of climate change and the Canadian Arctic. The team is capturing this important story using a high performance Nikon camera and lenses. Photographic gear was provided by London Drugs with support from Nikon Canada and the Vancouver Aquarium. For over 40 years, our agents have been partnering with clients to simplify risk management. Our agents are like no other. Our extensive experience and training means one agent can usually manage all your insurance options. You get the convenience of personalized service with the reassurance of knowing our entire team is here for you. KINeSYS Performance Spray Sunscreen Protect your skin from harmful UVA and UVB rays with a complete range of performance sunscreens for athletes and the entire family. Paraben, PABA, preservative, alcohol and oil FREE formulas in a convenient, fully recyclable, Microspray™ bottle. In 2006/7, Ray and two other runners ran the entire width of the Sahara Desert-7500 kms (4600 miles) in 111 days with no rest days-and in the process learned of the seriousness of the water crisis in Africa. The run was documented in a film directed by Oscar winner James Moll and narrated by Matt Damon. One of the goals of the film is to raise awareness for the water crisis in Africa.Following the Sahara expedition, Ray decided to dedicate and volunteer his time engaging Youth in the concept that we are all capable of the extraordinary. Ray is the founder of impossible2Possible, official Athletic Ambassador for the ONEXONE organization and is a board member of the Ryan's Well Foundation. Ray has completed 12 major expeditions to date and was recently a member of the South Pole Quest, the Siberian Express teams and in early 2011 ran the length of the Atacama Desert. In summer 2011 he crossed Death Valley National Park off-road. Tori was born and raised in Devon, Alberta. After graduating from high school she worked in Bangladesh with Agriteam Canada and also volunteered with UNICEF. From there, Tori travelled to Australia and it was during her travels there that she met Paul Gleeson. Tori teamed up with Paul for the cycle across Australia where she was responsible for all the fundraising and PR of the trip; these efforts resulted in her raising over $400,000 through child sponsorship prgrammes in Australia for World Vision.In 2006 Tori rowed across the Atlantic Ocean with Paul and at the age of 21, became the youngest woman ever to do this at the time. Tori co authored the book about the Atlantic Trip with Paul which was published in Canada in 2009. Tori is a sales executive at Mobify, a Vancouver based technology company that builds open mobile platforms. Maria runs her own PR company called Epic PR. Whether it’s an IPO, product launch or protracted controversy, Maria's forte is designing PR strategies that elevate a company’s profile and help it communicate with target audiences. Before Epic Public Relations, Maria was communications manager for a large public-traded company, PR consultant for one of Western Canada’s largest public relations agencies, and communications officer with several real estate organizations. She has more than 15 years of experience and has worked closely with a range of companies including Xantrex Technology, Intrawest, A&W, CIBC, Inex Pharmaceuticals and Capers Community Markets.Maria holds a bachelor’s degree in International Relations from UBC. In her spare time, she can be found perfecting her yoga moves at the local gym. Murray was born and raised in Vancouver and has been in the financial services industry since 1972 working with family businesses, entrepreneurs, professionals and retirees. A financial advisor with Nicola Wealth Management, Murray is not only well known within the wealth management industry but is probably one of the nicest people you will ever meet. With a keen interest in people and the highly developed skill of intuition, Murray works hard at listening to clients to make sure they are heard and understood whilst making sure the client's needs are truly taken care of. Murray is a member of many industry organisations and over the years he has been involved with many industry and community activities either as a speaker or committee member. Married for over 40 years, Murray and Patty have 3 children and 8 amazing grandchildren. Sharon Domaas was an educator for 35 years, she taught grades K-10, worked as a Community School Coordinator and Principal for the Burnaby school district. She stayed active in her community working on the governance committee which drafted the governance model for Community Health Boards. She was the president of Association for Community Education B.C. She is keenly interested in Global Ethics and is a trained facilitator for Global Ethics. She is currently the president of Nordic Star Services and serves on the Royal Columbian Hospital Board. Shane, who hails from Dublin in Ireland is founder of Belly Of Fire Publishing. An experienced marketeer, Shane published his first children’s book called Walter the wandering wave in 2010. The book was inspired by Shane’s passion for surfing. The second book in the Walter Series is due out in 2012 and in time, Shane is currently working on developing an animation series to bring Walter to the big screen. Shane lives in Vancouver with his girlfriend Elaine and is an outdoor enthusiast. Having surfed all over the world, Shane spends much of time outdoors snowboarding, mountain biking and swimming. Dave has since built his practice in the areas of orthopaedics and sports injury rehabilitation. He has worked with athletes of all levels in numerous sports from the Pro Rodeo Circuit to community beach soccer. He has been team therapist for the Canadian men’s Alpine Ski team and Vancouver Whitecaps men’s soccer team. He was the Canada Ski Cross team therapist for two seasons which included working with the team through the 2010 Vancouver Olympics. He now travels with the Ski Cross team occasionally, which allows him to spend more time at home with his young family.David is a former collegiate and national-level track and field athlete and former track & field coach, both of which have fuelled his interest in working with running athletes. In his free time, David is an avid snowboarder, kite boarder and basketball player. A trailblazer in her field, Linda-Joy Lee (LJ Lee) is an internationally recognized physiotherapist, author, educator and presenter. She mentors and leads her team at Synergy Physiotherapy (link to www.synergyphysio.ca in North Vancouver, and is co-founder of Discover Physio www.discoverphysio.ca and co-developer of “The Integrated Systems Model” (LJ Lee, Diane Lee), a new paradigm to assess and treat the whole person.LJ has also developed innovative methods to assess and treat the thoracic spine and ribcage, known as “The Thoracic Ring Approach”, which she teaches around the world. She has recently completed a research PhD at The University of Queensland in this area. Inspired by connectedness throughout the body, LJ is known for her unique way of looking at total body function. Her aim is to help people move more optimally and efficiently in their bodies to experience less pain and freedom of movement, and be able to train to their performance potential. She treats people from all walks of life, and consults with elite athletes from a variety of sports.LJ is passionate about helping people reach their potential, and believes a healthy environment supports health and movement. In 2009 she taught at a ship-based conference in the Arctic and saw first hand the changes happening in this special part of the world. She is extremely excited and honoured to be involved in this inspiring endeavor with The Last First team. Gillian is an innovative physiotherapist who combines her knowledge of orthopedic, neurologic, and visceral assessment and treatment to help her patients through times when their bodies are not performing to their potential. In her 15 year career, she has worked with athletes young and not so young, amateurs and professionals, obsessively active people and couch potatoes to get the most out of their bodies. She believes good rehabilitation is inspiring her patients to see beyond their potential for movement. Trained in the Integrated Systems Model (ISM) by Discover Physio (link to www.discoverphysio.ca approach co-developed by Linda-Joy (LJ) Lee and Diane Lee enables Gillian to discover the root cause, or driver, of a patient’s complaint or impairment. Could pelvic pain be eliminated by treating the thoracic rings? Working at Synergy Physio www.synergyphysio.ca, Gillian receives invaluable mentorship from LJ Lee, clinic owner and developer of the Thoracic Ring Approach, as well as opportunities to be an assistant on Discover Physio courses.This project with The Last First expedition is a natural expression of the things Gillian cares for including the possibilities of the human body, the Canadian North and the environment. Chris has worked with a variety of athletes from high school to professional level, including the 2004 National Champion UBC Women’s Basketball team, the 2006 USL Champion Vancouver Whitecaps, and the Canadian Men’s and Women’s Field Hockey teams at the 2006 Commonwealth Games in Melbourne, Australia. He was the physiotherapist with the Canadian Alpine Ski team (2006-08) and the Canadian Ski Cross team (2008-10), and was part of the Canadian Medical team for the 2010 Winter Olympics in Vancouver.Chris has also competed at the national level as a successful middle-distance runner, earning a silver medal at the Canadian Junior Track & Field Championships in 1996 and a bronze medal at the CIAU (CIS) Track & Field Championships in 1997. He is now the distance running coach at St. George’s School in Vancouver, and in his spare time is an avid skier, kayaker, and marathon runner. Chris is actively involved in several research projects with the Department of Orthopaedic Surgery at UBC. His practice philosophy is focused on manual therapy with movement retraining. Jacquie McCarnan has joined our team as our Director of Social Media and Online Community Outreach. Jacquie has a long history of engaging like-minded individuals in worthy causes.Working primarily with non-profit organizations, Jacquie has built her company, Social Media Canada to become a voice for the environment, women's leadership, eco-tourism in British Columbia and education across Canada. She is very excited to be working with the Mainstream Last First expedition and is looking forward to the impact the project will have on our understanding of climate change and other environmental issues. For all inquiries in regards to the The Mainstream Last First Expedition please contact Kevin, Paul, Frank or Denis. You can find all our personal contact details in the team section here.